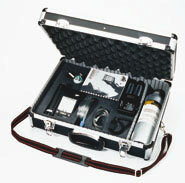 BW TechnologiesINED SPACE KIT contains the necessary equipment one needs to enter a confined space. Packed in a hard-sided carrying case, this package includes a 4-gas detector with a motorized sampling pump, and a 10 ft sampling hose. It has two rechargeable batteries, a 110 VAC charger, a 15 liter calibration gas cylinder and regulator, and a calibration hose.